Ok — we admit it — this watch is going to rock your socks off. Just in time for the holidays, Corum unveils what may well be its most scintillating watch to date. While I might venture to guess this new Corum Golden Bridge Miss Sapphires watch is for women only, I know a particular Middle-Eastern collector who won’t be able to resist the blue beauty. 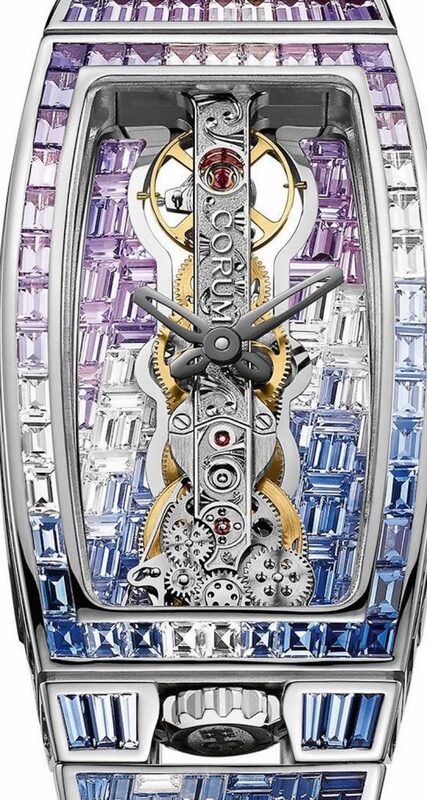 Nevertheless, the one-of-a-kind piece deftly blends the technology and fine craftsmanship that is indicative of the famed Golden Bridge watch with artistic elegance and incredible master gem setting. The Corum Golden Bridge Miss Sapphires watch is a unique piece retailing for $680,000. For those who may not be familiar with the Golden Bridge — could anyone not be familiar with it? — we just want to recall that the first ever Golden Bridge was unveiled to the world in 1980. It housed a linear movement that had been designed by master watchmaker Vincent Calabrese. Calabrese’s movement won awards and caught the eye of the then-owner of Corum Jean-Renee Bannwart — who swiftly met with Calabrese and struck a deal to use the linear caliber. The Golden Bridge has remained an icon in the watchmaking world thanks to its linear movement and exceptional innovation. Over the years, Corum has regularly unveiled new and daring iterations, but the Golden Bridge Sapphires may just top them all. The magnificent watch is set with The ought his crafted in 18-karat whit gold and the case measures 23.30 x 44.26 mm and is 13.30mm thick. The case is set with 145 sapphires weighing 6.55 carat in graduated tones of blues and purple hues. The 18-karat gold dial is further set wit h88 sapphires weighing 1.60 carats. and the 18-karat while gold braces is set with 510 sapphires weighing 9.24 carats for one of themes mesmerizing haute joaillerie watches ever made. In total it boasts 743 precious sapphires weighing 17.39 carats. As to the linear movement, caliber CO113, it is hand-wound movement with 40 hours of power reserve. The sapphire crystal and caseback are both anti reflective, and the watch is water resistant to 30 meters. Really? I just could never bring myself to wear this watch in the water — unless I was running away with it, which i would have to do because I can’t afford the justified price of $680,000. The Corum Golden Bridge Miss Sapphires watch is set with 743 precious sapphires weighing more than 17 carats.